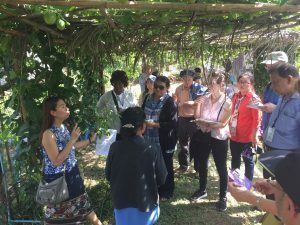 From 18 to 22 September 2017, partners of the Tropical Agriculture Platform (TAP) gathered in Lao People’s Democratic Republic (PDR), to participate in three meetings organized by the Food for Agriculture of the United Nations (FAO). Firstly, a meeting on the implementation of the Capacity Development for Agricultural Innovation System (CD for AIS) project took place, followed by TAP Partners Assembly and Steering Committee. The National Agriculture and Forestry Research Institute (NAFRI) hosted the events. In the first meeting on CD for AIS, discussions focused on the country innovation niches that were created at the beginning of the project. This includes, for example, niches on livestock management, organic vegetable production, commercialization of coffee, value addition on honey production, and many others. Project managers, national innovation facilitators (NIFs) and other representatives of these niches traveled to Lao PDR from as far as Angola, Burkina Faso, Ethiopia, Guatemala, Honduras and Rwanda. Bangladesh and Lao PDR represented the Asia-Pacific region. All country teams made poster presentations on the alignment of their work with national strategies, explained the linkages and roles of collaborating actors, shared early progress in the development of functional capacities of their niches, as well as emerging success stories. The meeting was also a good opportunity to share some of the issues that country teams are facing in the implementation of CD for AIS, such as lack of commitment and participation in the niches, physical difficulties to reach the niche locations, and understanding the links between different roles, tools and methods. The participants also explored how to feed project results and the Common Framework developed under the CD for AIS project into policy dialogue. The TAP Partners Assembly brought together almost all organizations that are currently engaged in the implementation of CD for AIS and TAPipedia – TAP’s main information sharing system. Discussions focused on the progress of integrating the Common Framework on CD for AIS in activities of the partners, as well as lessons learned. APAARI’s main integration activities included the application of the CD for AIS cycle in its visioning exercise and the development of its Strategic Plan 2017-2022. APAARI used multi-stakeholder consultations and interactive learning processes in both exercises, to reflect on the needs of the AIS, as well as related opportunities and challenges. The processes based on the Common Framework toolbox that APAARI applied in both exercises helped galvanize commitment for collective action. As part of the strategy development, APAARI also conducted a capacity needs assessment by looking at the different thematic areas of the AIS that require strengthening. To analyse the collected data, it applied other Common Framework tools, including needs prioritization matrix, SWOT, stakeholder mapping and analysis, as well as gap analysis to determine APAARI’s value added. APAARI has also been actively involved in advocacy and knowledge management (KM) activities. Firstly, it has been promoting the use of the Common Framework and TAPipedia within its network of members and partners through various meetings and Social Media. Secondly, it has created space for TAP on APAARI’s new website, harvested experiences on CD for AIS, and disseminated these resources within its network, both online and face-to-face. From the application of the Common Framework, APAARI has learned that commitment needs to be galvanized at every stage of the cycle, not just at the beginning. It is a continuous effort that needs to be applied at every stage of the cycle to promote collective action. Though APAARI realizes that capacity development is a driver of change and innovation, other important factors and processes had to be considered to help accelerate CD for AIS. These include: KM, partnership and networking, advocacy, and participation of women and youth. Together with CD, they now form the basis of the APAARI strategy. The Common Framework Toolbox provides guidance on the use of stakeholder mapping and analysis, as well as many other methodologies that help develop soft capacities, including capacity to learn, reflect, and collaborate. For APAARI, stakeholder mapping and analysis have become the main learning tool to better target and engage partners, mobilize membership, develop resource mobilization strategy, and refine the KM and communication strategy. The analysis is also driving APAARI’s biennial operational plan, allowing APAARI design mechanisms for system-wide learning. APAARI also presented its planned activities for 2017 that include: (i) co-organizing a global webinar on TAPipedia in collaboration with GFAR, for which APAARI will mobilize participation of its members and partners in Asia-Pacific; (ii) conducting a regional webinar with universities in Asia-Pacific to promote the Common Framework and its use in university curricula, as well as to emphasize functional capacities in the university system; (iii) integrating the Common Framework into APAARI’s M&E system, as well as its ongoing activities, namely: KM, Agri-Biotechnology (APCoAB), and ASTI project. In addition to presenting progress, the meeting participants revisited the vision and mission of the CD for AIS project, and discussed the proposed action plan for 2018-2021. A small working group was formed to refine and finalize the plan based on expected outcomes, indicators, and the role of contributing partners, including APAARI. A field trip organized by NAFRI was an excellent conclusion of the four-day meetings. The participants were able to talk to two different groups of farmers working in livestock management and organic vegetable production. 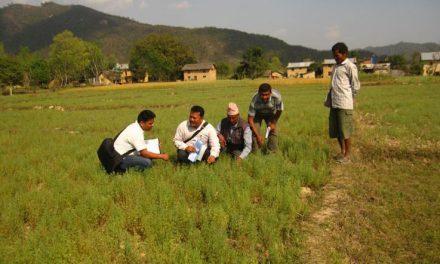 They had an opportunity to learn how the CD for AIS project – with its focus on the development of functional capacities – is making a difference in the lives of participating farmers and their communities. One interviewed farmer shared that the project is building the capacity of her organic vegetable association to think and organize itself to make the business more profitable. However, in Lao PDR, the demand for organic vegetables is increasing. This will require more investment in and knowledge of innovative technologies, in addition to developing functional capacities. These challenges that are beyond the CD for AIS project are forcing the TAP partners to think and explore more innovative solutions to address the gaps, hence also building their capacities during the process.